We are now back in New Zealand and after getting over jet lag, the flu, and sorting ourselves out, some of us are now back into the swing of things, although the male member of the touring party has now developed pneumonia so there will be a delay before he feels up to doing his bit. We are so far behind with blog entries and we have some serious catching up to do with our last few weeks of travelling. You can look forward to blogs on lots of museum and library visits, shows we went to see, people we farewelled, and a few days stopover in Singapore before getting home. Here is the first of the catch up blogs. I’m sure most of you will know exactly the history of Bletchley but for those who are unfamiliar Bletchley is where during WWII some of the greatest minds collaborated on breaking codes, inventing machines, techniques and computers to form a major part in the Allies overcoming Hitler, all the while Bletchley was kept very secret even from the partners of those who worked there. You can read more about the Park here on their excellent website. Some of you may be familiar with a couple of movies which were made about some of the work done at the Park, one being Enigma and the other The Imitation Game. As an aside, as Lodge owners we hosted the main actors of Enigma a few years ago. Back to the visit. We arrived at the Park straight from the train from London before midday and spent the next few hours wandering through the complex until closing time. The Park covers around 23ha made up of many buildings including the main mansion house. The huts, as they are known, housed the serious work that went on in code decryption and interception, cipher, and the associated technical machinery invented and modified as part of the intelligence work. As an interesting aside over half of the workers were women. the mansion where the headquarters were located. inside the main entrance was this room with its ornate glass ceiling. The Park has had extensive upgrade over the past few years with displays and interactive modelling set in each of the huts explaining the workings and daily life of the people who worked there. Work went on in these huts intercepting not only German messaging but Russian, Japanese, Italian, Spanish and Portugese languages as well as naval, army, airforce and police intelligence. As well as the small machinery, there is the Bombe, the large machine built to decode the Enigma machine. We managed to arrive at this point in the park when a 45minute talk on the history, the people and workings of the Bombe were carefully explained. As well, a working demonstration of the machine was given. It was totally fascinating. I later asked how long a modern computer would take to decipher the same code as the Bombe (which took a couple of hours), and was told that it wasn’t until around the year 2000 when dual processors came into being that a modern computer could tackle such a feat. Our walk around the many huts continued with lots to keep us entertained until closing time when Jackie & Hossein were arriving to collect us. this sign piqued my interest, where female translators has the title of Lady Translator. I wondered why male translators did not have a similar gender classification? The following morning Jackie returned us to Bletchley for the morning as we still had plenty to see. I wanted to peruse through a few more of the huts whilst a Roy wanted to visit the National Computing Museum which is also on the premises. This was to see, amongst other things, Colossus, the super computer built and used at the complex. I shall let Roy elaborate on this subject. Even after having two good goes at seeing everything at Bletchley we could have easily spent at least another day there, and with more work being done on more huts, we look forward to a return visit in the future. We were utterly heartbroken to hear that our dear friend Marj passed away on 4th January. We send our sincere condolences and much love to her husband and best mate Brian, and to her family. We shall miss her joie de vivre, positive attitude, and for making us laugh. We first met Brian and Marj when we started our life in the motorhome, in fact we met them on our first week on the road and they were ever so welcoming and helpful, especially on happy hour etiquette. Subsequently we met up with them often and became good friends. We ended up travelling together in a happy convoy of two a number of times. The first time was north to Cape Reinga, another time around the Karikari Peninsular and then we did the trip though the Wairarapa and up through the southern Hawkes Bay where we had lots of fun. We remember when Marj got pipped at being unable to walk with Brian and refusing to become a “little old lady” so she got herself a bright pink Segway. Then there was no holding her back, off she went everywhere and anywhere. She introduced us to having brunch in a Sunday to remind ourselves what day of the week it was and that other people had to go to work the next day, and to remind ourselves how fortunate we were. We shall remember her with much fondness and especially her “can do” attitude in the face of adversity. We had set aside a few days to visit a couple of family members so with trains tickets booked, contact made we set off to make our way north. It was a journey of many links, we took the bus from Alex’s home at just after 8am which then required a relatively short walk to the train station in Erith. The train from Erith to London Bridge takes about 40minutes then a walk from London Bridge station to the underground which took us past Borough Market where we resisted the temptation to visit, after all we were on a schedule! Then it was the tube to Euston station, then another walk to the train station at Euston to catch the train to Bletchley. The train to Bletchley was a short 35 minute trip via fast train, and on arrival we took a taxi to Bletchley Park as we were uncertain as to how far away the station was from the park, it turned out it wasn’t too far and we could have walked. We then spent the next 4-5hrs wandering around Bletchley before being picked up by my cousin Jackie and her husband Hossein. Phew! Most modes of transport covered today; bus, tube, train, taxi, car and shanks’ pony. NB. A separate blog entry on Bletchley Park will follow. Jackie is actually my cousin Hilda’s daughter, and tomorrow we would be catching up with Hilda. It can become a little confusing at times as my Mums name is Hilda, and it is on Mums side of the family that we are connected, with my Mum and cousin Hilda’s Mum being sisters. It gets even more confusing as Mum was the 17th of 19 children and Hilda’s mum was number 2, which makes for a lot of cousins as well making the age range in cousins rather extensive. Back to the original story. Jackie and Hossein live just outside Milton Keynes which is not too far from Bletchley, so we didn’t have too far to travel. They had kindly offered to host us for the night in their lovely home. After lots and lots of chat, it was time for dinner. Hossein had prepared for us an amazing Persian feast, and I mean, a feast. entree was a selection of delights which were accompanied by Persian bread. I cannot remember the names of the dishes, but they included yoghurt, salads, herbs, aubergine, cheese, nuts, and spinach prepared in many different ways. There was also the traditional drink Doogh which is a fermented yoghurt drink. Talking and catching up continued through the meal, so much so that none of us remembered to take a picture of the main course, which was an amazing array of dishes including chicken, lamb, two rice dishes one of which included barberries, potatoes, vegetable and herb side dishes all of which were delicious. It must have taken hours of careful preparation for which we were extremely appreciative. Jackie then presented us with a Persian dessert of cream, cream, rosewater and pistachios. It was very refreshing at the end of the meal, and I did remember to take a picture of that! After dinner, we relaxed in the lounge and over sweetmeats accompanied by Persian tea we talked and talked until the wee small hours, time for bed – it had been a long day. The following morning Jackie took Roy and I back to Bletchley so we could finish off what we had not covered the previous day with arrangements made for Jackie to pick us up at 1pm. Then it was back to their place to meet up with Jackie’s sister Dawn who was bringing Ken & Hilda over for a visit. Back row L-R: Dawn, Jackie, Bernice, Roy with Ken and Hilda in the front. Over lunch and into the late afternoon the talking continued as there was much to catch up on since our last visit in 2010/2011. However, all good things come to an end, and with fond farewells it was time for us to leave. Jackie took us to Milton Keynes train station where we caught the train to our next destination, Droitwich Spa near Worcester this time a one and a half hour train trip. This trip required just one change in Birmingham, and with times already tight between journeys it was just our luck that our train was delayed just out of Birmingham with signalling problems, it meant we ended up having just 3 minutes to change platforms and trains! However, we made it just as the doors were closing for the final leg of the journey where we were met at the station by Susan. Sue’s father and my father are cousins which means I’m getting to visit cousins on both sides of the family. We had also met up with Sue and her sister Veronica last time we were here, and as well Sue and her husband Martin had visited us in NZ in 2011. We headed off to Sue & Martins farmhouse out in the countryside where we were greeted by a lovely warm house and a beautiful dinner. Again we ended up talking and laughing until late, cosy at the table in front of the Aga stove. The following day I spent reading, as in reading the heap of files of family documents that Sue has which include a pile of letters written by my Mum to Sue’s parents, Sydney and Vera, over the years since the mid 1960’s. As well there were letters from my grandpop and great aunts and uncles, a wealth of information for me to go through and take photos to add to our records. Most of the letters contained an insight into daily life for our family and brought back many memories. Sue also found a stash of photographs that she thought she had lost which included pictures of my great grandmother as well as the rest of the family over the years. There were lots of ooohs and aaahs as I recognised people and places, putting dates and names to some of the unlabelled photographs. After another superb meal in the afternoon, it was time for us to head back to London, reversing most of our train travels from the other day. I have to add here that from both sides of the family, the Womersley and Coatham lines, there is an obvious family propensity to being fantastic cooks that has managed to work its way down through the generations and across the globe. Our return journey was uneventful and with Alex picking us up from the train station in Erith, we made it back ready to make the most of the week ahead. It’s hard to believe that just six months ago the Borough market was the scene of a terrible terrorist attack but here we were at the market which was a hustle of activity and people all happily going about their business. The market is one of the oldest, if not the oldest, in the UK. Borough Market has existed in one form or another for around 1,000 years. Its precise start date is impossible to pin down: there was no official opening, no ribbon-cutting ceremony, not even a brief mention in a chronicle. The best date available, and the one used as the basis for the Market’s millennium celebration, is 1014. Borough, then as now, was a place defined by its position at one end of London Bridge—for centuries, the only route across the river into the capital. It is likely that London’s first post-Roman bridge was constructed here in the mid-990s, partly to bolster the city’s defences against Viking raiders who routinely sailed up the Thames to kick seven shades of wattle and daub out of the locals. Borough Market with the Shard in the background. Amongst the produce on sale are fresh fruit and vegetables, cheese, meat, game, baked bread and pastries, sweet treats, honey, fresh fish & shellfish and much much more. And yes, I did have a test of a few samples, purely for research purposes of course although I did buy a London gin for imbibing over the festive season. All that wandering was making us hungry but what were we to choose? Roy was eyeing up the oyster bar with a choice of varieties of raw oysters from England and Europe served in their shell, or maybe something warming on this chilly day. so what did Roy choose? It’s hidden under its tinfoil cover. scallops of course. We did get chatting to a Japanese family who came to share our table, they were enjoying a selection of oysters as each in Japan so they were enjoying the small ones that they got at the market for just a couple of pounds each. I didn’t dare tell them that they are known as the pest of the sea in NZ and people gather them easily. There has been a running joke in the household that Roy has a bit of a cheese addiction, he buys and tries cheese wherever and whenever there is an opportunity, in fact he has been told he cannot buy anymore cheese until he has finished the pile already stored in the fridge at home! but what’s this? Caught again in a cheese shop trying a few samples, but he was good…he only bought one!! It’s a fantastic market and no doubt we shall be back again soon. 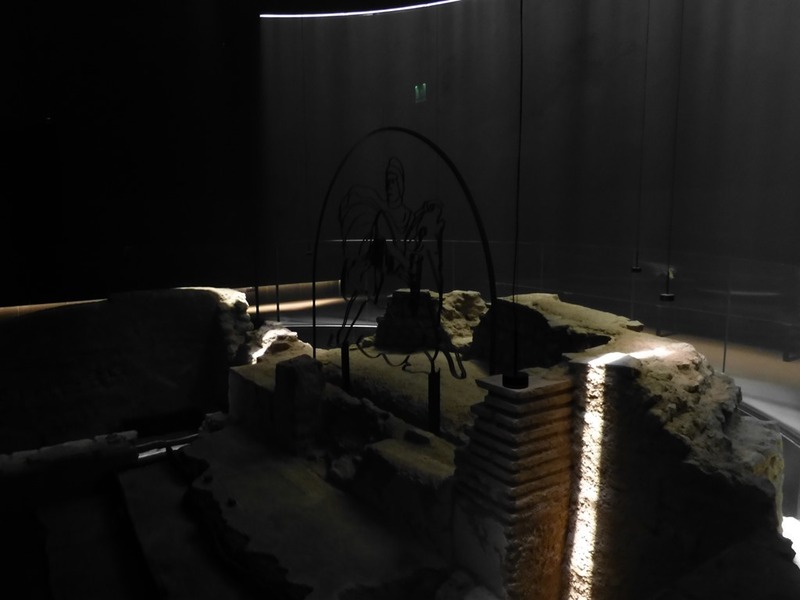 So what is a Mithraeum and why have a look? 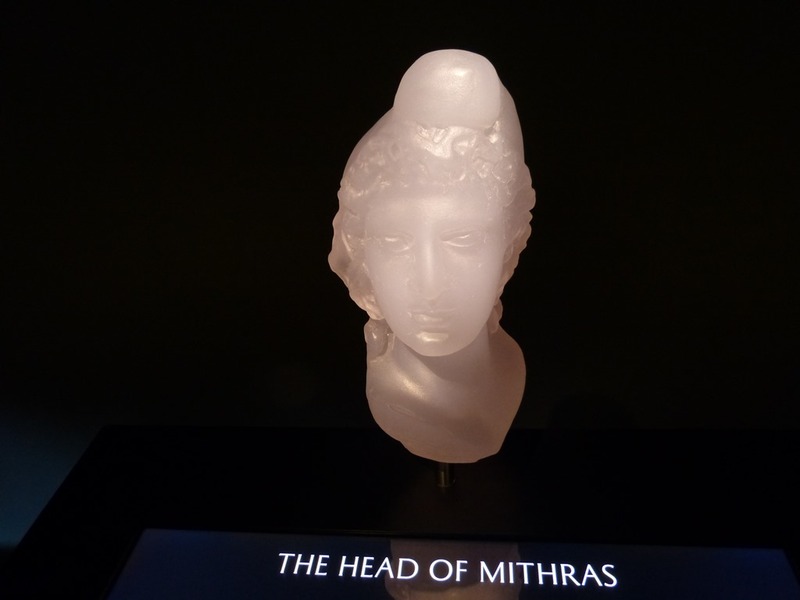 OK so what or who is Mithras? The short answer is we know a little but not a lot of detail. 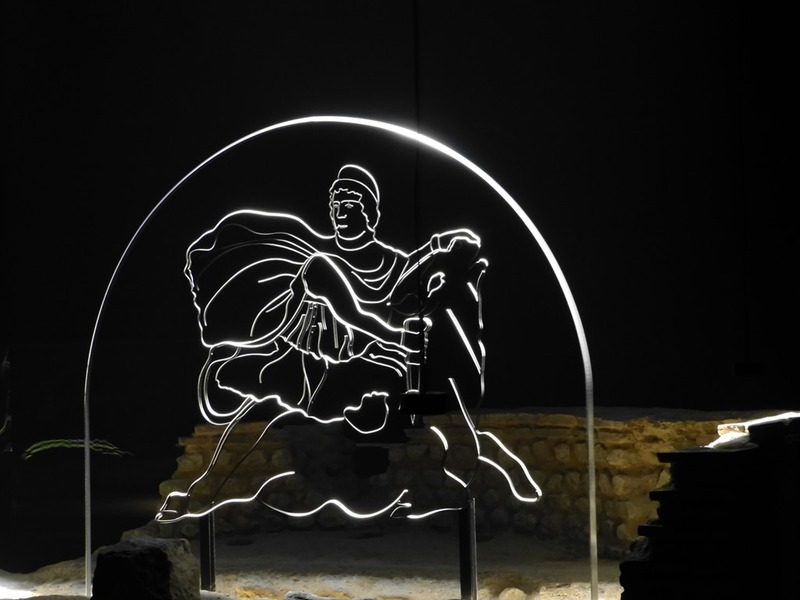 The cult of Mithras was worshipped by the early Romans throughout the Roman Empire. 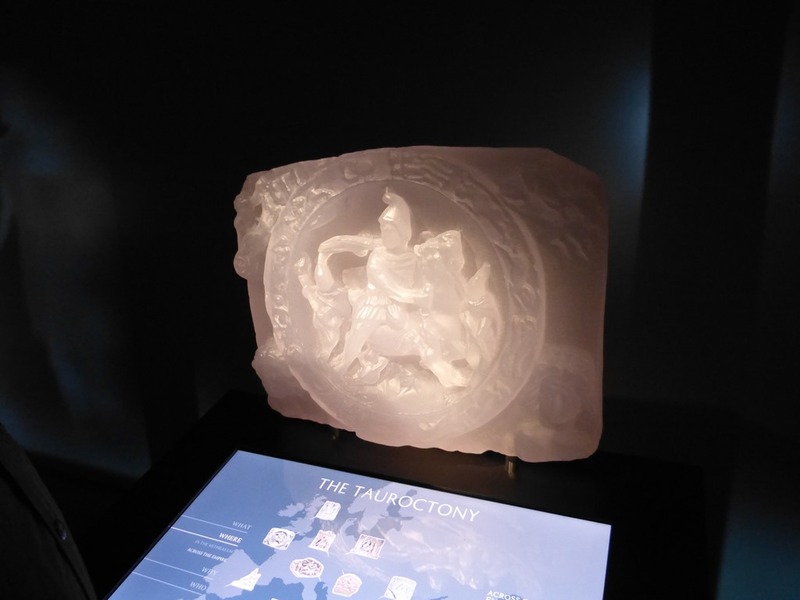 A number of Mithras Temples have been found throughout the present day countries which were part of the Roman Empire. The BBC In our Time Series has a programme giving a detailed discussion on the cult. 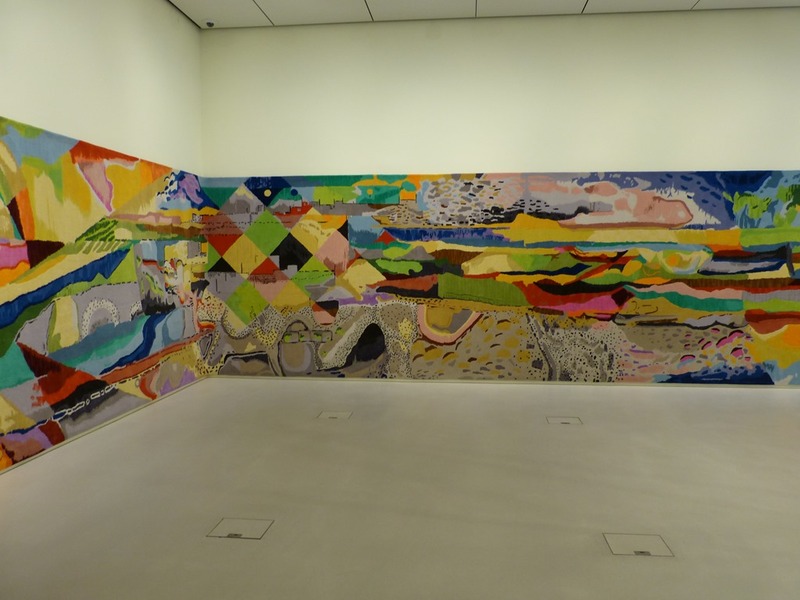 The display within the Bloomberg building is on three levels. 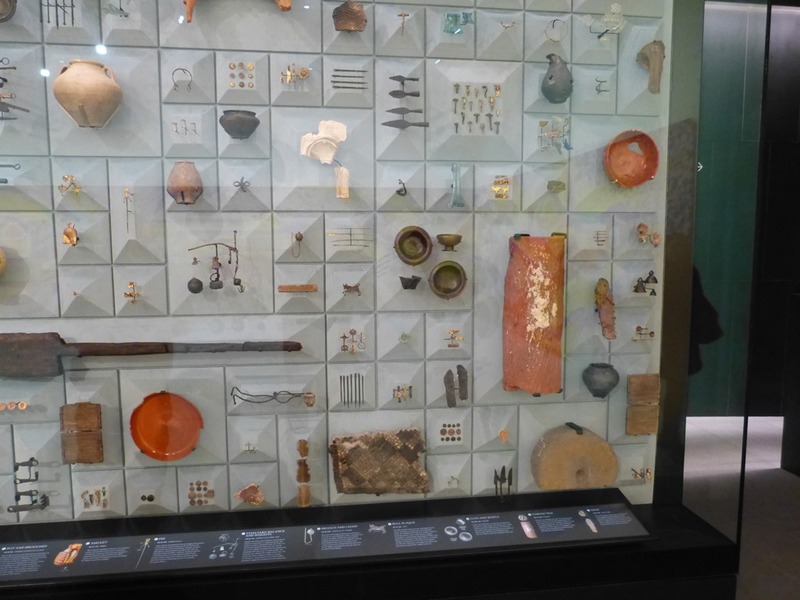 The first is at street level where there is a short introduction, abstract artwork and a detailed display of some 600 of the 14,000 artefacts discovered on the site gives a representative view of Roman cultural artefacts. More detail on these is contained in the Archaeology at Bloomberg pdf which can be downloaded from the above link. 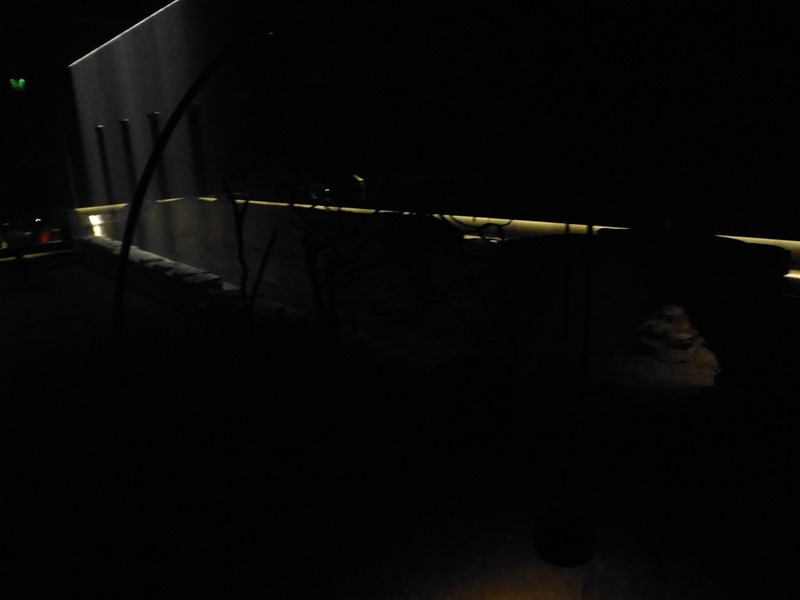 A few photos follow to give some idea of the artefacts on display. 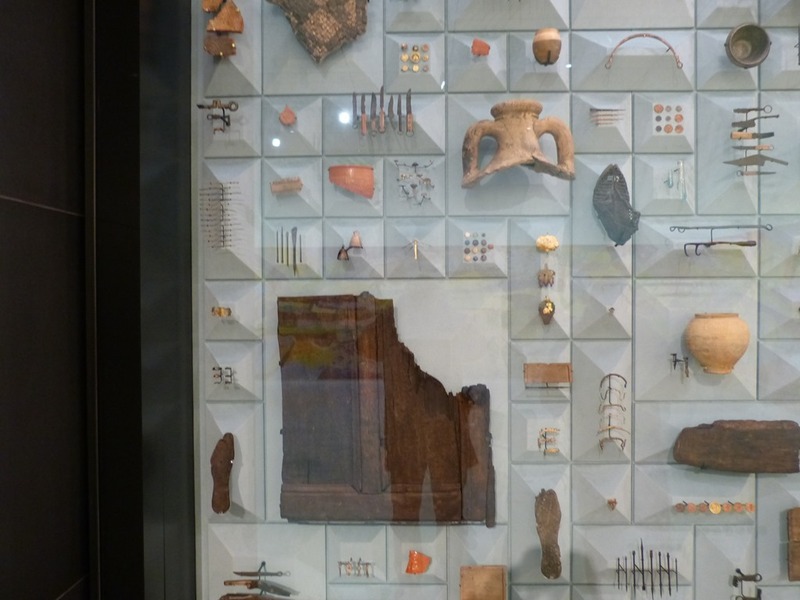 On the next level down there is a display of important artefacts from the site that illustrate the rituals and beliefs of the Mithra religion. 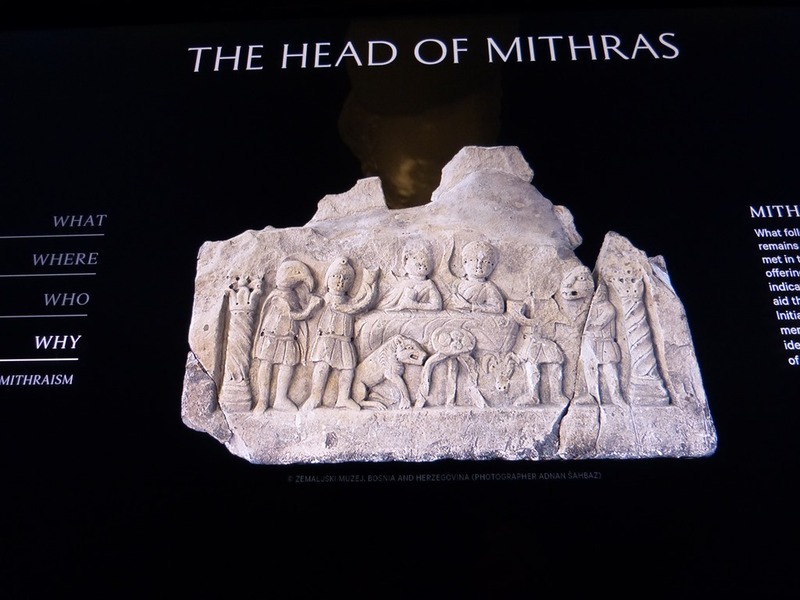 Below each of the three artefacts is a display giving more details of the Mithran religion. Alex had time off between Christmas and New Year and one of the things we wanted to do was to go out for a nice lunch to The Curlew in East Sussex, a restaurant where the head chef Gary is a friend of Alex’s and is a restaurant that is gaining a very well earned reputation. Mr Google told us it was just over an hour to get there, but of course we had to factor in traffic so allowed ourselves plenty of time, perhaps enough time to visit Bodiam Castle which was nearby. And what a lunch we had, cocktails to start with, I had the hot gin & tonic cocktail and delicious it was too and perfect to warm you up on a chilly day. We made our choices of what to have for lunch and then sat back to enjoy the following 2 1/2 hours. First the canapés smoked salmon gougère, goats cheese tart, beef tartare. Clockwise from top left; goats cheese, Cod cheeks, pigeon breast, pork belly. Sorry but I cannot remember what was with what, except to say that every single morsel was deliciously outstanding. Each plate was not only beautifully presented, it was an amazing selection of flavours all served on piping hot plates a particular thing that I have an issue with as there is nothing more annoying than having a hot meal served on a cold plate. We all chose a wine, an English white for Alex, an English red for Bernice and a French red for Roy. It not only included a selection of English cheeses but also a variety of breads and crackers accompanied by a walnut chutney, pickled apple, quince paste and charcoal celery. At the conclusion of the meal, we thanked Gary for his innovative and delicious menu before we set off on our journey home where, we all agreed that we didn’t need anything for dinner. We headed into London on Friday afternoon aiming to eventually end up in the Westend as we had booked seats to go and see a show. Alex, Antony Roy and I made our way into town via train and tube with Ian joining us later once he had finished work. But first we all need to have something to eat as we hadn’t had lunch at it was by now nearing 5pm and the hunger pangs were starting to gnaw away. We headed to a restaurant by Covent Garden called Ping Pong, for a dim sum feast. Alex reminded us that we had actually been here before when we last visited London, except that time the restaurant was Spanish tapas bar and our company at that time was my niece Fran and her now hubby Clive. I’ve looked for the photo of us having dinner together then but I cannot find it amongst the few thousands of pictures we have! From there we headed across to the Westend Theatre district where we were set to see a show, called Mischief Movie Night, an improvised movie live on stage. We first had to meet up with Ian before the show, we then settled in to watch the show. What happens with this show is that you suggest a genre, location and title and Mischief Theatre’s improvisers bring the show to life, complete with rewinds, fast forwards, directors cuts and a live score. So when it came time to call out suggestions for genres, a few were called out and picked then we had to vote for which one we wanted….Alex’s choice of Kung Fu movie made the cut as did Roy’s suggestion of Spaghetti Western with Roy’s suggestion winning out to popular vote. Other extra things that were added to the plot was the classic gunfight scene, the setting was an old picture theatre and a dinosaur had to make an appearance! Much hilarity ensued, with the cast at times unable to contain themselves when things went awry and ended up in fits of laughter. We all thoroughly enjoyed the humour and it was a really great night out, with a train journey home to wrap up the night. We were all going to Twickenham to watch a rugby match, including Ian’s parents Christine & Barry, their cousin Julie & Brian, Matt and Alex’s friend Helen completed the group. First we headed to the Campden pub to meet up with everyone for a bite to eat for lunch before making our trek across the city, oh and this was the same pub we came to on Christmas Day. At times it was like herding kittens. The train journey meant we had multiple changes to make and platforms to find, but we got there in plenty of time to then make the trek from train station to the rugby grounds. walking along the streets with the crowds. It was a packed stadium with nearly 78,000 people in attendance, but with clear views of the pitch, a huge screen at each end of the stadium and smaller screen directly in front of us, we were guaranteed not to miss a thing. The ball delivery was a little different as well with a high wire stretched across the top of the stadium and a guy bouncing along the wire to the middle to deliver the ball dropping it from the great height. I have to admit that I could not watch him as it made me feel rather ill.
in both pictures above, you can see the tightrope walker in the screen and if you look carefully you can also see him in the little piece of sky peeping through the top of the stadium. In the lower picture, the ball has just been dropped which you can see in the tv screen. Please note that I took these pictures by not looking and just pointing and clicking!!! We enjoyed the game and the crowd was very good. Rugby crowds are very different to football (aka soccer) crowds here. Apparently football supporters are kept very separate from each other with lots of police and crowd control in evidence. In many matches, one group of supporters is locked in the grounds whilst the opposition supporters are let out, and usually in totally different directions so they never meet! A little different to what we experience and what is experienced at the rugby where everyone is mixed and friendly banter ensues. I am told that rugby is for “posh” people in the UK, the ones that go to the right schools, don’t ask me if it’s the public or private school as the two types of school are labeled the opposite of what we know them as in NZ! A few of the many food stall at the grounds, we had a drink or two and a bite to eat whilst we waited for the crowds to dissipate. We managed to stay together and retrace our steps home. the rabble on the train. Oh and if you were wondering, the Harlequins won 50-21. A few of Alex & Ian’s friends had organised a dinner at an Indian Restaurant, aka a curry house in this neck of the woods, for a group of us to go to on New Years Eve but first they all descended upon their house for an afternoon of watching the football and trying out a few gin based cocktails as we somehow seem to have managed to put together a reasonably large selection of gins. From here we then went to the Curry House for an evening that proved to be brilliant on many counts. First the company was great, second the food was amazingly delicious and very very different to the NZ versions of curry, and thirdly there was entertainment. And believe me when I mean entertainment, I mean we were thoroughly entertained. The entertainment was one guy on a key board who we must admit that initially we had serious reservations regarding his competence, however after a couple of songs, which included local improvised lyrics, wigs hats and glasses were continually being added for dramatic effect, we were all soon into the swing of things. With the refreshments flowing, he was being helped along by our vociferous table (albeit except me as I had woken that day without a voice), but I did try!!! After an hilarious evening out we headed back home to continue the celebrations including watching on TV London putting on an impressive display of fireworks. It was a slower (and later) start to the day today, by late morning we were all up ready for the days activities. Alex and I went off to do the grocery shopping whilst the blokes went off to the local football match, supporting Welling. Apparently Roy is becoming known as an honorary long distance supporter, as I think this is his third or fourth game he has been to!!! Meanwhile Alex and I had a quiet day at home before everyone returned for dinner then we all settled down in front of the TV to watch the darts final live. I know, who would have thought that I would want to watch men throwing darts at a dart board? But after having to watch a number of games surrounded by some very avid and vociferous fans, I became a little interested! And yes, it was a good final. All in all a busy and fun few days.